Rob, Jana, and I went to the Olympic National Park today, and on the way back stopped at Dungeness National Wildlife Refuge. It's on the northern coast of Washington, and is this odd shaped "spit" that juts out into the ocean. While we were walking along a high bluff, I noticed the sea gulls would occasionally fly along the edge of the bluff, at about eye level for us. So, I decided to put on the telephoto lens to get a nice close-up picture the next time one flew by. While I was waiting, I noticed a large bird approaching from off in the distance. It seemed a bit darker than a sea gull and a bit larger. 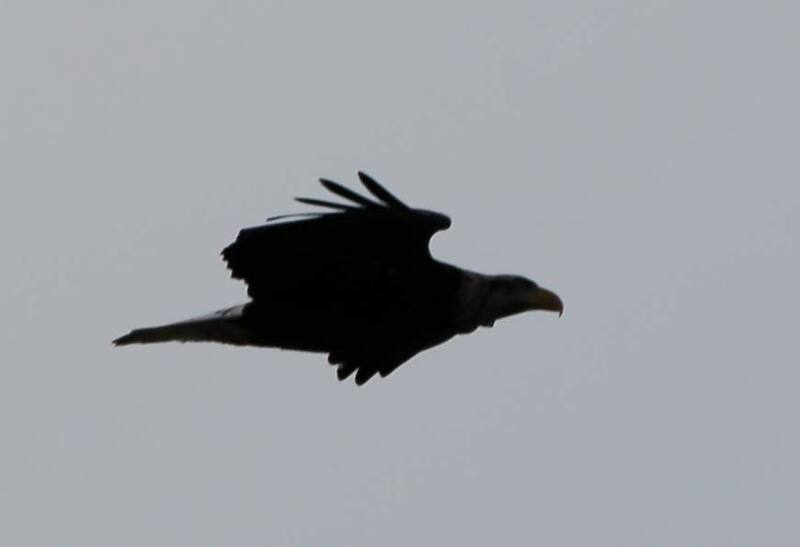 It was a very pleasant surprise when we realized it was a bald eagle! And it flew right by us! Unfortunately, the lighting wasn't great (or my camera skills are lacking - or maybe it's a combination of both), so the picture is mostly just a silhouette, but I'm still quite pleased with my first eagle picture.